It's no secret that by warming your house or apartment, you can significantly save your money, which would be spent on heating the room. 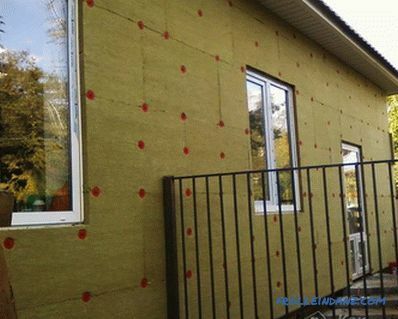 To date, there are many ways of insulation and a variety of insulating materials with which you can do this. One of them is mineral wool. It is an excellent material consisting of melted glass, rocks and blast furnace slag. The binder is resin. Mineral wool has a fibrous structure with different directions of fibers, depending on the purpose of the material. So, if you want to save heat in your home, you need to warm it. 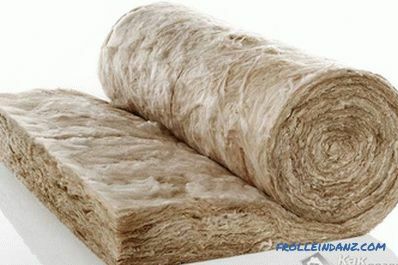 Thanks to the mineral wool, you can avoid the loss of heat, and your heating costs will significantly decrease. 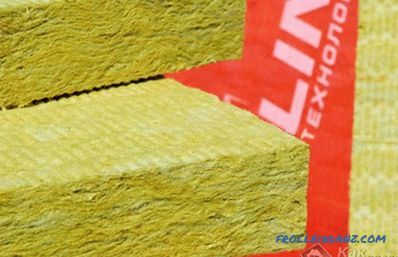 This article will look at how to warm the house with mineral wool, and if you follow the rules of installation and advice, then, even without experience, you will be able to cope with this task. Very often builders prefer to warm the house with mineral wool. Why? Because of its many positive characteristics. They produce material in the form of large mats or in the form of slabs (slabs have more demand). Their density is 80 kg / m 3 . 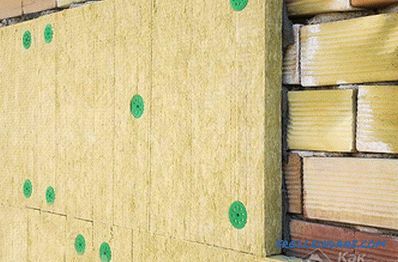 The standard sizes of mineral wool are 50 * 1000 mm and 60 * 1200 mm, but the thickness can be 50 mm, 100 mm or even 150 mm. does not cause corrosion in metal objects that can with it to contact. 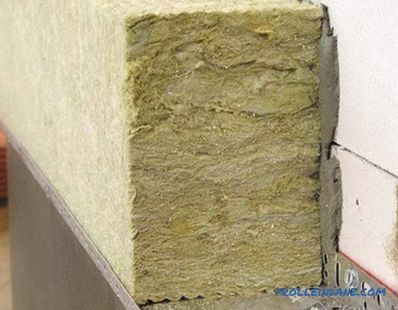 One of the disadvantages of mineral wool is its price, which is much higher than that of the same foam plastic. Environmentally friendly material can not be called, because of the layers of cotton wool can be formaldehyde resin. 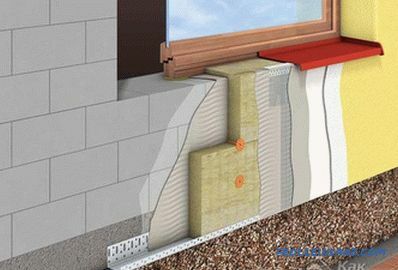 Let's take a look at how the wall insulation works with this material. to remove foreign objects that may stick out and s walls: corners, nails, fittings, etc. After cleaning, the walls should be primed. This is a mandatory event, which should be spelled out in the estimates. To prime the surface, use a deep penetration primer, applying it to the walls with a roller or paint brush. When there are traces of mold or mildew on the wall, treat the place with an antifungal agent or mold remedy. Places where the base connects with the wall, it is recommended to treat aquastop. If you insulate the house with your own hands for the first time , and as a cladding material will serve as siding or plaster coated "bark beetle", it is important to fix all the plates carefully. Therefore, start from the back walls, which are not visible, to practice installing the slabs and plastering them. 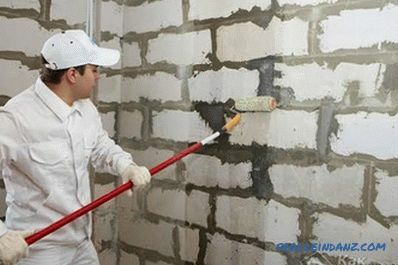 At that moment, when you insulate the walls, which are visible, your equipment will be much better, as you put your hand. 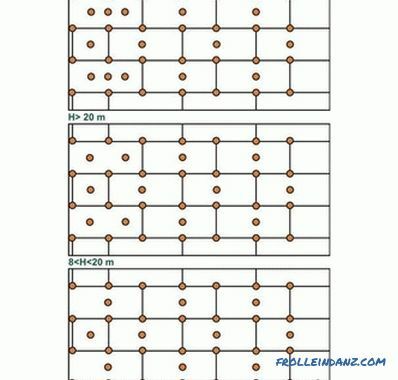 In order to properly perform the facade weatherization, you need to perform some sort of organizational marking. They include installation of vertical, horizontal and diagonal sagging. Exposed at the level of the suspension will help to see the differences in the walls and will serve as a guideline in order to mount the insulation plates evenly. A simple nylon cord stretched between the pins will serve as a plumb. As pins, you can use bars of reinforcement inserted into the holes of the wall, which are made in advance at different points. Do not forget that after installation these rods should be removed, therefore, you should not hammer them into the wall, and so you can easily remove them. To begin the work on weatherization you need to go down, moving up. Therefore, in the lower part you need to install a metal bar or basement profile, which will act as a supporting guide and will provide support for the first row of insulation plates. It also protects them from various rodents and regulates the gap between the wall and insulation. 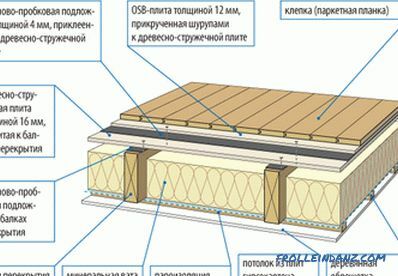 The width of the profile is selected depending on the width of the insulation plates. So, along the marked line, you need to attach a bar and mark on the wall the points where the holes will be made. The recommended distance between them is 300 mm. Drill Ø6 mm holes along the marking line. It now remains to attach the profile and fix it with the help of dowels. Parts of the basement profile are connected using connecting elements. Lining washers can be used to even out different irregularities. 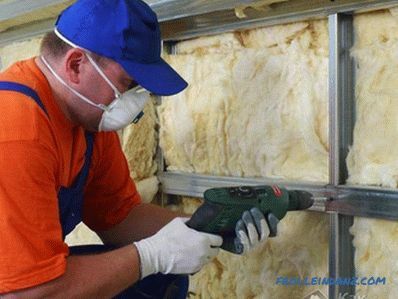 The thickness of the insulation layer depends on the climate of the region where you live. 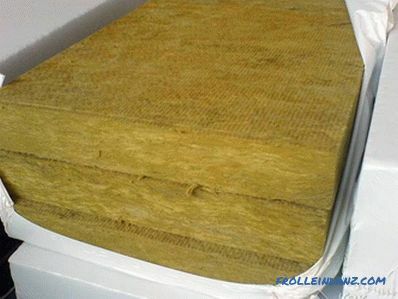 The colder the climate, the thicker the layer of mineral wool. In regions with severe winters, plates can be laid in two layers. In this case, be sure to mount them not on a par with one another, but in a run-in. 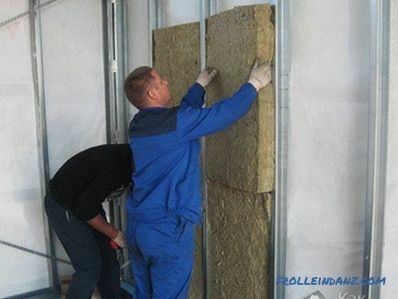 Now after all preparations you can proceed to the installation of insulation boards. Attached to the outside of the wall, they will be using a special adhesive designed for such purposes. For good adhesion, you can use Ceresit CT190. First you need to mix the glue. To do this you need a bucket of 15-20 liters, water and a mixer. Mix the glue in the bucket, adding water according to the proportions indicated on the package. Stir until the mass becomes homogeneous, without lumps. The composition should resemble puree. Leave the mixture for 5 minutes so that it is completely “ripe”, and then mix again to give it the best plastic and adhesive properties. All this solution should be used within 2 hours, because its properties are lost further. It is time to apply glue. Since the mineral plates are very dense, their weight is also rather big. Therefore, you need to apply glue over the entire surface of the plate. The point method of applying adhesive in this case is not suitable. Applying glue to the entire surface, it can be smoothed with a comb trowel. This method of gluing the plates is good because a reinforcing layer is created on the surface, which prevents the plates from deforming if moisture gets there. For reliability, a continuous application can be supplemented with "lapses". Immediately after applying the adhesive, the plates are applied to the wall surface. Remember that the first row of insulation will be based on the base profile. Press the slab firmly so that it is in good contact with the wall. Irregularities can be leveled by striking a long float. Excess glue on the sides and top must be removed with a spatula. The first row should be set ideally, since all errors will be reflected in the next rows. Therefore, laying insulation carefully check the level. Subsequent rows should be mounted with a ligation, with offset vertical joints, as a brickwork. Ensure that the plates are flush with each other. If you have allowed the formation of cracks more than 5 mm between the plates, you need to fill them with pieces of the plate. During work, you should protect yourself, as mineral wool fibers can get on the skin and cause discomfort and scabies. To avoid this, wear gloves and clothing that covers skin. And if you handle slab grater, be sure to wear respirators. In places where there are openings (window frames or doors), the plates need to be trimmed to the desired size and continue laying. Do not forget to check each row by level so that the surface is flat. 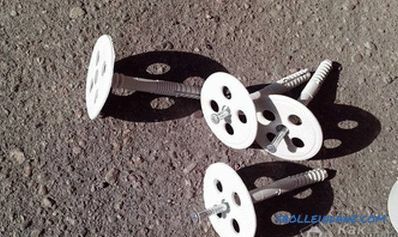 Fixing by dowels is made at least 1 day after installation platesTo do this, holes are drilled in the wall of the desired diameter and depth, into which the dowel will be hammered. To work you need a hammer drill, hammer and dowels. Consider that according to the technology, if the building has 5 floors and less, then 1 m 2 insulation should be hammered with 5-7 dowels. 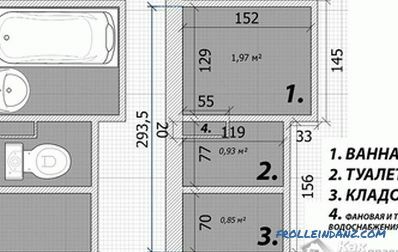 When the building height is 9 floors, then on 1 m 2 you need 7-8 pieces. Their location should be at the corners of the plate, and 1 dowel to hammer in the middle. The corners of the building and the place near the door and window openings need to be further strengthened with several dowels. After the dowels are clogged, they need to be puttied with glue before reinforcement is made with mesh. To give the plates shock resistance and protect them from mechanical damage, all corners are reinforced with a special reinforced PVC profile with a grid. To do this, all corners of the building need to apply a special reinforcing mixture with a layer of 2 mm. Its width should be slightly larger than the width of the profile with the grid. Attach the corner to the corner and drown it in the solution with a smooth trowel. Carefully iron the mesh so that it sinks smoothly into the solution. After all the corners have been made, you need to wait 1 day and begin to reinforce the entire surface of the facade plates. It is not recommended to perform such work in direct sunlight. To reinforce insulation you need to buy a special glass cloth mesh. On the plates, apply a special mixture for reinforcement. Roll out a roll of reinforcing mesh and fasten its end to the top of the insulated wall. Embed the mesh into the solution, gradually moving down the wall. Cut off the excess and continue the process until you reinforce all the walls. To avoid cracking, overlap one mesh to another at least 100 mm. The last stage of reinforcement will be applying to the grid a covering layer of a solution of 1-2 mm wet on wet. It remains to wait 2-3 days for everything to dry. This is by no means all the materials with which to trim your facade. Naturally, the choice of decorative coating depends on your desire and availability of funds. That's all, now your home is fully insulated and prepared for the harsh conditions of winter. Having warmed your house with mineral wool, you can not only make it warmer, but also save on heating services. 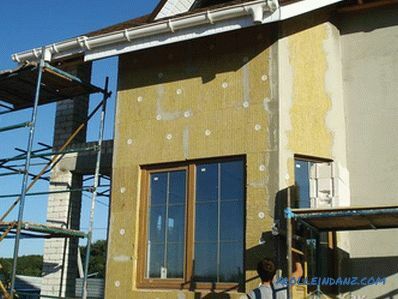 But it is possible to insulate the house not only from the outside, but also from inside . Let's find out how this can be done. The construction is based on wooden logs of the floor. The recommended distance between them is 580-590 mm. Due to this, heat-insulating plates will fit snugly to the frame, leaving no cold bridges, which will also simplify installation. 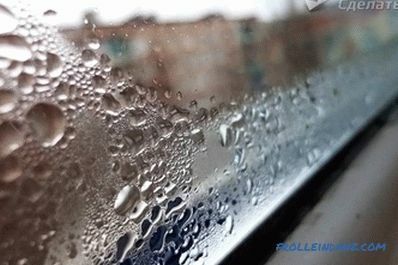 If the ceiling is in a place with high humidity, for example, a bathroom, before installing the cotton wool, cover the perimeter with a vapor barrier film. Floor Warming Requirements Now you can lay the plates. Their thickness is selected by thermal calculation. Plates just fit between the lags. 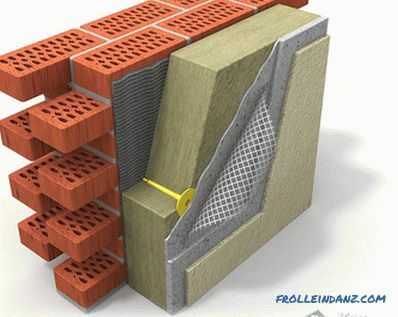 If two layers of insulation are made, then you need to observe the gap of joints of at least 100-150 mm so that a bond is formed, due to which cold bridges will not form between the plates. For this, the plates must be cut with a simple knife. In order to avoid condensation of moisture, another layer of vapor insulating material with an overlap of 100-150 mm must be laid on top of the slab on top of the plates. It remains to build a continuous floor covering of large-sized self-supporting materials that ensure the transfer and distribution of the load on the floor. This may be OSB plywood, chipboard, fiberboard, wood or special drywall. The final stage of floor insulation is the installation of a finishing coating at your discretion. In order to warm the walls from the inside, you need to install an additional the frame in which the insulation will be installed and subsequently sewn up with sheets of drywall. 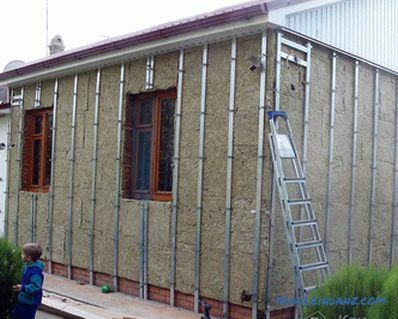 Let's consider 3 methods of how to insulate the walls inside the house. For a start, you it is necessary to build in the wall mounting brackets for the profile under the drywall. Attach them vertically with a distance of up to 600 mm. This distance is enough for fixing the mineral material, for assembling the frame and for fixing the profile. Staples need to give a shape that resembles the letter "P". You should have peculiar horns that stick out of the wall across the surface. These braces need to wear a minvata. Before cutting a piece of mineral wool, measure the height of the walls. Cut the piece with a small margin, as the material may be deformed. 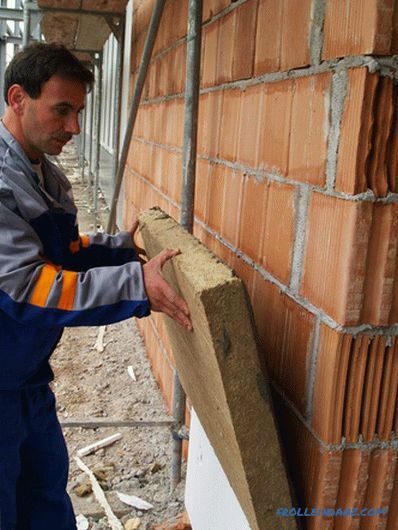 For example, if the height of the wall is 2.20 m, then the section of mineral wool must be 70–100 mm greater. The cut-out strip needs to be put on the mounting brackets. Cotton wool is easily pierced with straps and hangs on them in a vertical position, therefore, it is not necessary to additionally fasten it. Set the next strip in the same way, only overlapping with the previous layer. Then the surface of the wall will be tightly covered without cold bridges. Next, install the drywall profile and cover the mineral wool with a vapor barrier material that can be fixed with small screws. Then you need to fasten the drywall to the established profile. Finally, it remains only to apply the selected decorative layer on the drywall. 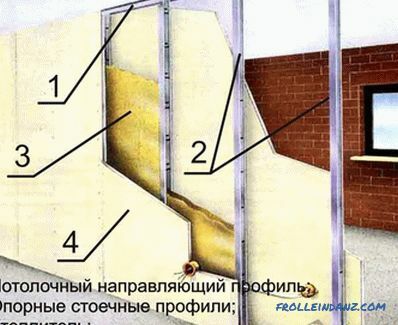 The second method is to assemble a ready-made frame from the profile for plasterboard wall plastering. It is necessary to fasten the profile at a distance of no more than 400 mm from each other. Since the width of the heat insulator is in the range from 500 to 1200 mm, you can put a heater in the frame spans. In the case when the distance between the profile and the wall is small, mineral wool can be layered to the desired width. 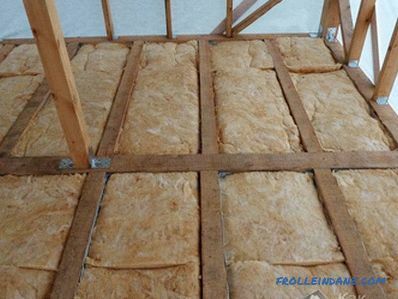 Your main task - to lay the material tightly, because it affects the quality of insulation. As soon as you lay all the mineral wool on the walls, stretch the vapor barrier material over the profile. After that, the surface is ready, and you can fasten drywall and apply finishing material. To start, build partition frame. One side should be sheathed with sheets of drywall, OSB or chipboard. The recommended distance between profiles is 580-600 mm. On the other hand, you need to lay mineral wool. 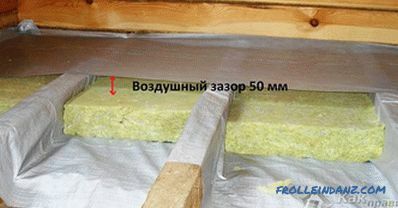 If the width between the profiles is 590 mm, then the cut piece of mineral wool should be 7-10 mm larger in order to sit close and not slide down, since no additional fastening is foreseen. 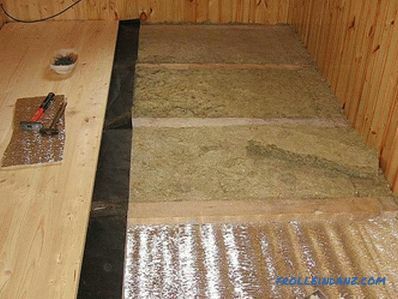 When it is necessary to lay two layers of insulation, the gap between the plates should be at least 150 mm. After completing the work, the partition must be sewn up with sheets of drywall, OSB or particle board and finish to finish. That's all, in such simple ways you can keep the heat in the house, make living in it more comfortable and pleasant. All you need is to buy the material and follow the instructions described above. If you had some experience with mineral wool and in the process you have difficulties, share it with us in the comments. What exactly were the difficulties, and what helped to cope with them? Maybe you know something that was not mentioned in our article. 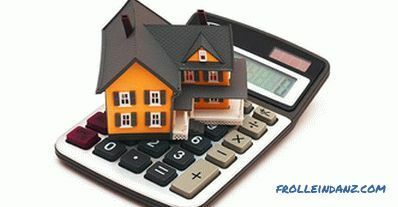 Your invaluable experience will help all readers to perform perfect insulation of their own homes! How to warm the basement. Insulation of pipes in the street. Warming of the roof from the inside. How to insulate walls with foam plastic. How to insulate a well.